The Premium Sportster Solo Seat w/ Scissor (aka Hairpin) Springs is the Classic Look in the Solo Seat Experience. There is NO drilling, cutting or welding needed. Simply bolt on the included Black Powder Coated brackets to existing mounting points on your Sportster and attach the scissor springs and seat to them. You have a choice of a Smooth Black or Diamond Black 13" Seat. Both are pictured above. The steel seat pans have quality seat vinyl covering high density seat foam, providing a great look, a comfortable ride, and long-lasting durability. 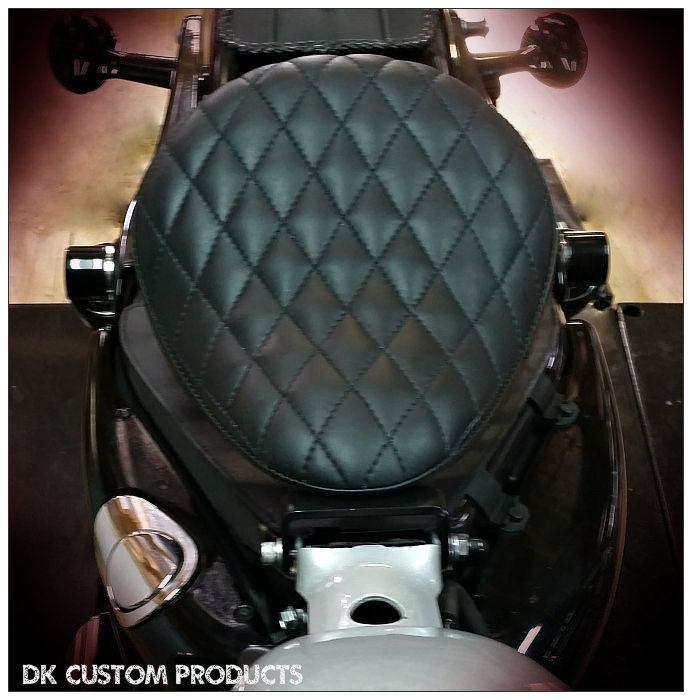 We have combined the Best Finished Solo Seats with the Proven DK Solo Seat mounting hardware, creating a Premium Sportster Solo Seat Line. Backed by a Lifetime Warranty on all steel components, you cannot get a better value! These Low Profile Seats are 13" long, 10" at the widest point, & have a 3" roll, giving support, but keeping a low look. For detailed information on all the Spring Options, Click HERE. With our exclusive Optional Adjustable Adapter you gain 2 inches of movement of the seat forward or rearward. This allows you to dial in the ideal seating position in relationship to the grips and footpegs. It is really appreciated by taller riders & riders that just want more room to stretch out! 16" Premium Bobber Solo Seats also available. This is a direct bolt-on for 04-Up Sportsters, and w/ minor fab work can fit earlier year model Sportsters AND a variety of other motorcycles. If you have a 4.5 gallon tank, you will need the Optional Adjustable Adapter so that the nose of the seat clears the back of the gas tank.